From Twitch to Facebook to Periscope, live streaming is a growing phenomenon that’s making some decent money for the people who own the platform. For the actual people recording the streams and making things happen, not so much. Maestro, a Los Angeles-based company with a toolkit for capturing data and analytics, and engaging with viewers in live streams, has raised $3 million in a new round of funding to give more control to the companies that are actually making the streams, rather than the companies that are hosting them. Especially as the audience for watching eSports grows, live streaming will take a bigger share of the media marketplace, according to some analysts and industry observers, and that means more money for whoever can best engage with the new audience. It was the eSports market that initially attracted Hersh Interactive Group, the family office investing on behalf of Kenneth Hersh, a billionaire oil and gas investor who also backs the Texas Rangers. Like other owner-investors in traditional sports, Hersh is becoming more active in the eSports market and the firm sees Maestro as a way to control more of the streaming experience for fans that may want to watch his esports team EnVyUS and to get more information about those fans. Additional investors in the round included 500 Startups from its Los Angeles based growth capital initiative and from the Stanford StartX Fund and Rubicon Venture Capital. In all, Maestro has raised $5.8 million with previous money coming in a $2.8 million seed investment led by 500 Startups LA-based partner Andrei Marinescu, and included Scrum Ventures, Three Six Zero Group, and Walden Venture Capital partners Larry and Drew Marcus. The company has initially focused its attention on the gaming market and has created branded destinations for live streams for Sony PlayStation, Microsoft, Pokemon, Warner Bros. Games, Electronic Arts, Capcom, Wargaming, ESL, Dreamhack, and ELEAGUE (just to name a few). “Maestro’s rapid penetration within esports supports our thesis that publishers, leagues, and teams will increasingly seek ways to connect with their audiences through branded experiences they control. The product’s strategic design provides a framework for continued innovation and value creation to propel the industry forward as it evolves,” said Randy Chappel, Managing Director of HIG, in a statement. But the company insists that its toolkit can be used for more than just gaming, already signing up The Grammy’s and Coachella as partners as well. 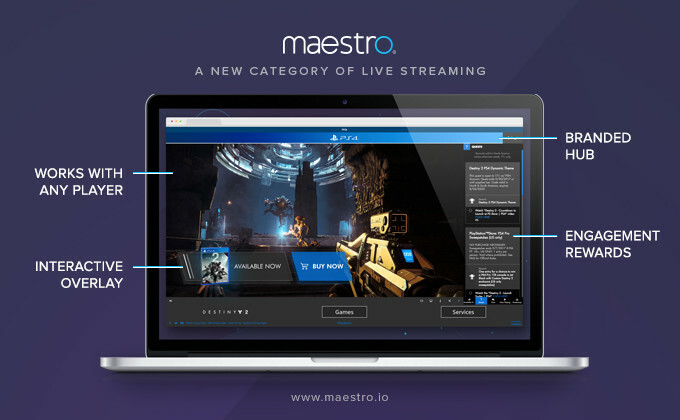 Any livestream can benefit from Maestro’s tools, which can include polling, micro-games associated with the stream, and other communication tools for fan engagement. Just as importantly, the data that these live-streaming fans provide stays with a company, instead of being captured by a platform like Twitch, Twitter, or Facebook. The Startup Battlefield alumnus and 1st and Future finalist said it will use the money to boost its sales and marketing efforts and target new industries. “As sophistication around streaming becomes the norm, the new metrics revolve around quality of interaction, retention, and attribution to the bottom line. We’re excited to enable businesses around the world to create robust, long-term live streaming strategies through their own destinations,” said Ari Evans, founder and Chief Executive Officer, in a statement.